SKU: TPAW. Categories: Caitlín R. Kiernan, Past Publications. 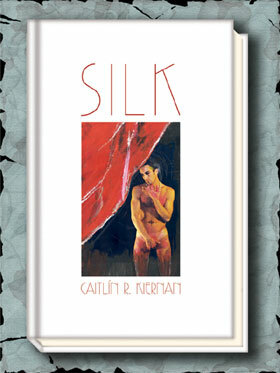 Now available, the highly anticipated first short story collection by the award-winning author of Silk, Caitlí­n R. Kiernan. Tales of Pain and Wonder are twenty one short stories, a number written expressly for this Gauntlet signed limited edition (right now the only edition available). 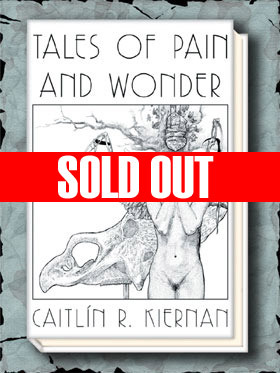 Through the unflinching lens of her exquisite prose, in Tales of Pain and Wonder Kiernan explores a surreal world where the fantastic and the mundane are never separated by more than the insubstantial thickness of a shadow. From the murderous back streets of New Orleans to an abandoned shipyard on the Hudson River, from sun-weary Los Angeles to a maze of dank and forgotten tunnels beneath Manhattan, these stories present a landscape at once alien and undeniably familiar. Richard Kirk furnishes cover and interior art, Douglas E. Winter provides an introduction and Peter Straub an afterword. The book is signed by all four. Buy directly from Gauntlet (and only Gauntlet) and, as a bonus, get a free chapbook Caitlí­n wrote exclusively for Gauntlet. This chapbook will not be sold nor made available to dealers. 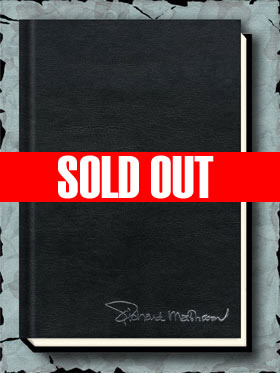 An instant collectible limited to 150 copies. In some respects this is the diciest sort of book for me to cover, because once it comes time to sit at the Mac and transmit impressions, I have to rely strictly on memory. Which certainly speaks highly of the book in question, since that means, from start to finish, I’ve been loath to set the thing down and take notes, and risk breaking the mood established by the author. And in case you have thus far avoided encountering her work to any great degree (something that’s getting harder and harder to manage), Caitlí­n Kiernan is a writer whose work is fairly drenched in mood and atmosphere, and emotions that linger heavily like the discomforting charge in the air after a shout. In an era short on spare time that prizes bare-bones minimalism, Kiernan is an unrepentant maximalist, engaged in an ongoing love affair with language that is vitally apparent throughout each of the twenty-one stories (and concluding poem) in this volume. Her work is every bit as exquisitely detailed as the complement of line drawings by Richard Kirk, specially commissioned for this release. It’s this latter story (in which a scientist gleaning specimens from the daily refuse of a Birmingham mine witnesses a Lovecraftian anomaly deep underground) that most fully exhibits what some may find pleasantly surprising about Kiernan’s work. Kiernan, who herself has more than a casual interest in paleontology, sometimes roves landscapes and people alike with a scientific eye, and spies … well, like the title says, wonders.Â More often than not they’re just tantalizing glimpses, but even so, these biological asides provide a curious, affecting, and even hopeful counterbalance to the plight of her wounded characters, who are less the victims of mere existence than of the worst impulses in each other. But perhaps the most fascinating aspect of this collection is the interlocking nature of its stories. Each stands quite well on its own, and in fact many I’ve initially encountered in magazines and anthologies and they’ve never seemed incomplete, yet placed back-to-back they assume a much grander scheme: characters recur, sometimes taking multiple turns at center stage, other times making a cameo while on the way to their own fates; incidents alluded to in one tale become the focus of another; artifacts in an opulent room become mysterious dusty discoveries made decades later; a family lineage spans multiple generations. And then there’s the enigmatic Jimmy DeSade, seen over the course of many years as everything from a grieving antihero to a gun-toting badass to something just this side of a demon, depending on perspective.